Choose whether or not to submit test scores with your application. Apply today! From our beautiful campus in Duluth, MN, to our top-ranked academic programs, St. Scholastica offers the complete package. We are a community of learners, working together, playing together and growing together. When you become a Saint, you join something larger, something stronger. You join a community. So take a look around. Schedule a visit. Meet your admissions counselor. Follow our blog. 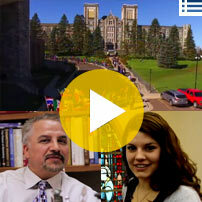 Learn a bit about our values and what a great value a St. Scholastica education really is. And when you're ready, fill out an application. We're excited for you to join us! St. Scholastica awards millions of dollars in scholarships each year. Take a look at what we offer. It's all about community. You'll find a supportive setting and numerous opportunities to get involved. Check out some campus life videos made by our students to get a glimpse of life at CSS. We invite you to explore the value of a CSS education. How much will it cost? It's less than you may think. Use our Net Price Calculator to estimate how much a year at St. Scholastica will cost and how much financial aid you can expect. 100% of CSS students who apply receive financial aid. Do we have your major? St. Scholastica offers a broad range of programs. Find out if we have the major you've been thinking about.